Thanks to the idiocy of US Airways, I was recently stuck in an airport for six hours, and finally had a chance to read a new report on women in philosophy (in the UK) by Helen Beebee and Jenny Saul. And grade a pile of papers. And read some short stories. And argue with some managers. And gee, Au Bon Pain has pretty good sandwiches, did you know? This is a smart and interesting report, and I like its directness. For example, the first section heading is "what we would like you to do." OK, what? To begin with, they'd like to see the report disseminated and discussed as widely as possible. Have a look--it really is interesting. Section 2 contains facts and figures that are quite striking. Women start out being nearly half of all philosophy majors (or the UK equivalent), but steadily thin out at higher levels. 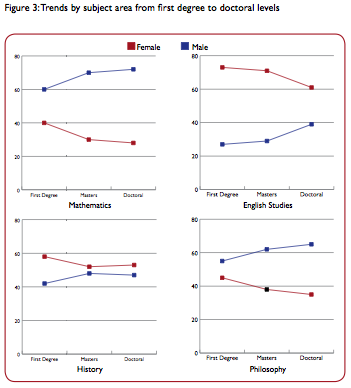 The authors note that women thin out at higher levels in other fields too. The end result in philosophy is particularly striking, because women start out being in the minority. The trend in philosophy most resembles the trend in math, which they see as revealing. Here's another pleasingly direct bit of the report - it's from section 3. We do not fully understand why the proportion of women philosophers is so low. Some will insist that it is due to innate and unchangeable psychological differences between women and men. This may be true (though there are good reasons to doubt such claims; see e.g. 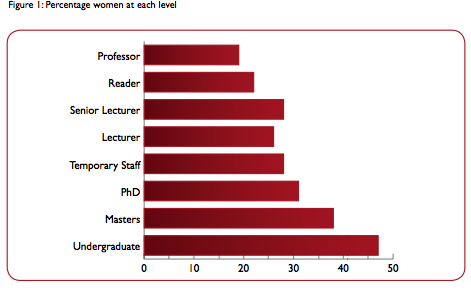 Fine 2010, Jordan-Young 2010), but there is also strong evidence that there are other barriers to women in philosophy. As long as these barriers exist, it will be impossible to know whether the underrepresentation of women is indeed due to such innate differences, or to these barriers. And since these barriers are, as we will see, both unjust and bad for philosophy, there is good reason for us to strive to remove them. "We don't fully understand" is honest, and "let's remove barriers" makes sense, as does the idea that they're "unjust and bad for philosophy." But surely there's a false dichotomy here. It's not true that women are underrepresented because of either (1) "innate and unchangeable psychological differences between women and men" or (2) "barriers to women in philosophy." They could be underrepresented because of (3) culturally transmitted differences between men and women. Or because of (2) and (3). Or because of (1), (2), and (3). Anyhow, they focus on barriers. One is "implicit bias" against women in philosophy - on the part of philosophers both male and female. The sheer fact that a CV is headed by a woman's name causes it to be rated more negatively, a study of psychologists (though not philosophers) has shown. Another is "stereotype threat," a concept developed and substantiated by Claude Steele (see here). Steele's research shows that performance immediately drops when people are self-conscious about belong to a group stereotyped as less good at X. Stereotype threat also makes the work environment more stressful for women. This is important because women philosophers’ membership of the stereotyped group—women— can be made manifest routinely in the day-to-day business of academic life. Many women philosophers are routinely the only female speaker at a conference or workshop or the only female member on an appointments panel. In departments with small numbers of women staff, the women will often find themselves the only woman sitting on a departmental committee. Moreover, stereotypically male behaviour amongst male (and perhaps also female) colleagues will serve to make women’s status as women even more salient. One piece of stereotypically male behaviour is an aggressive style of argument in the seminar room. This might include, for example, displaying hostility—by words, tone of voice or body language—towards a speaker or audience (or a class discussion) member whom one thinks has failed to grasp a point or adequately address an objection, or pursuing a point well past the stage where it is obvious that the speaker has no adequate response (Beebee, forthcoming). Relatedly, philosophers’ standard metaphors for what goes on in the seminar room are those of competition, fighting and battle (Rooney, 2010). People win and lose arguments, shoot down points, go for the jugular, fight their corner, take no prisoners, don’t pull their punches, and so on. This all falls squarely in the ‘stereotypically male’ category. The third barrier they focus on is sexual harassment. Women don't have the same opportunities as men if hotshot Professor X has to be avoided by the female students because he's an aggressive womanizer. There's got to be sexual harassment and implicit bias in English departments too, but women are not underrepresented in English departments. The most compelling hypothesis in the report is the one about stereotype threat and related dynamics. Women in philosophy are susceptible to the feeling of being outsiders, as several women say in section 4 ("Case Reports"). That makes the work environment more uncomfortable for them. Gradually, more and more are driven away. People don't do as well when they feel like outsiders. They gravitate toward environments in which they feel like insiders. So, away from philosophy to ... something else. But I'm not 100% convinced that the whole explanation for women feeling like outsiders can be obtained if you don't venture into culturally transmitted (or possibly innate - I can't rule that out) differences between men and women. When I look back at various philosophy environments I've been in, I recall the outsider feeling being present to varying degrees. Some people teach and write philosophy with enormous human warmth. In other people's hands, philosophy feels like a much more remote and abstract affair. Some topics have more human warmth, some much less. Remote and abstract topics can be engrossing, but it takes (for me) some human warmth to feel at home. I suspect more women feel this way than men do, and it's part of the reason why women are more numerous in some areas of philosophy (e.g. ethics) than in others. It might also be one of the reasons why women thin out at higher (colder!) levels. For a lot of women, philosophy is a great place to visit, but they don't want to live there. Not forever, anyway. Another story entirely about why women feel like outsiders in philosophy comes from Steven Stich and Andrew Buchwalter. Their research suggests that women are more likely to feel out of place in philosophy classes, because they are less likely to share the instructor's intuitions. OK, maybe, but to my mind that's minor, compared with feeling not at home with a whole subject. If you're a woman in a class on metaphysics, and you find the whole subject a bit weird and alien, that's got to dwarf any discomfort you might feel because the professor's intuitions about some arcane problem are different from yours. Now, barriers are nice to identify, because they can be lifted. But how can awareness of these "differences" factors be used to increase the number of women in philosophy? Stich and Buchwalter think that less intuition-driven philosophy will lead to less alienation for women, since they won't have to contend with having minority intuitions. Recognizing that women are "people people" more often than men could (conceivably) lead someone to try to attract more female students by adopting a different teaching style (more example-driven, more focused on real world implications, etc). I can think of various ways to make use of the notion that more "real life importance" is needed to make women feel at home. But enough with these speculations. The report is well worth reading, sharing, and discussing. Could an additional factor be that in general (though obviously not in all cases) women have more opportunity NOT to have full-time careers, but instead to, say, combine at-home parenting with part-time or less stressful and time-consuming jobs? Even among smart and capable people, not everyone wants to devote themself to getting to the "top" in business, academia, sports, or the arts. Does the report consider that female philosophers may be choosing to take advantage of opportunities to pursue more well-rounded lives -- choices that in general are not as viable for their male colleagues? Nothing like that in the report, and I agree--those kinds of factors and trajectories are part of the story. I've made choices along those lines and I've seen other women do so as well--where their male counterparts usually didn't have the same options. So the lesson is that we should appreciate airport delays? Ha, once I settled in it was OK, but the arguing with managers part was a little ... intense. I couldn't convince them that if their errors cause me to be 6 hours late to my destination, they owe me some form of compensation. Their reasoning was roughly--how could we make $$$ if we agreed with you? Well, one of the reasons I keep coming back to this blog is the human warmth and *niceness* (not mere civility) evident in it. In that respect it appears in *marked* contrast to certain other well-known philosophy blogs. So I think that people like you are doing important work in making academic philosophy a more open and habitable place - for women and for everyone who has "outsider" feelings - and you ought to be encouraged and rewarded for it. The only question is how to make that happen! Thank you! in the wild world of philosophy, I think people care about being seen as terrifyingly smart, more than they want to be seen as nice. So ... yes, there's a notable niceness deficit in ... certain ... places. I'd love to know how many philosoohers have outsider feelings, and how they break down by gender.